Vice President Mike Pence was in japan today speaking to the national business community and he had words of friendship, hope, and mutual prosperity to share with our friends in the Far East. I bring greetings from the President of the United States, President Donald Trump. 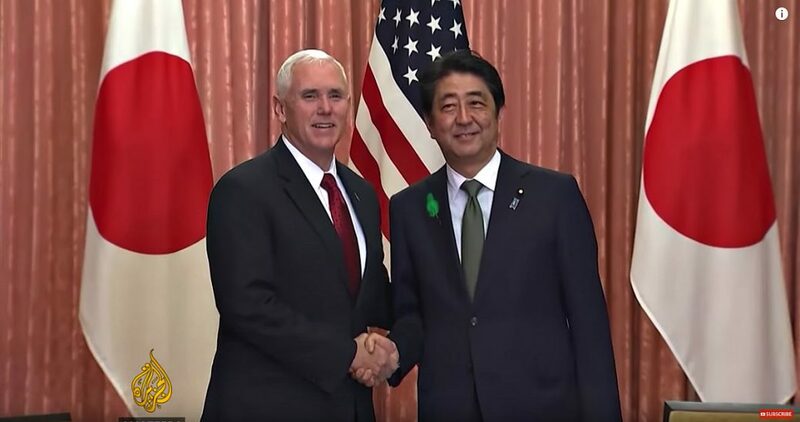 Yesterday, under the President’s behalf, I had the honor to meet with Prime Minister Abe to reaffirm the abiding friendship and the enduring alliance between Japan and the United States. The United States-Japan alliance is the cornerstone of peace, prosperity, and freedom in the Asia Pacific. And under President Donald Trump, America is firmly committed to strengthening our alliance and defending the prosperity and security that we have built together between our nations. As President Trump told Prime Minister Abe, so I say on his behalf today to all of the business leaders that are gathered here, to all of the people of Japan: We are with you 100 percent. Know that we stand with you, now and always, and together, we will address the challenges that we face in these uncertain times; and most especially, we will address the region’s most dangerous and urgent threat to peace and security — the regime in North Korea. Now rest assured, under President Trump, the United States is unwavering in its commitment to defend Japan. Earlier today I had a great privilege to speak on the deck of USS Ronald Reagan at Yokosuka Naval Base. Her steel deck I said there signifies the ironclad alliance between the United States and Japan. And it is a testament to our commitment to our shared security. Today, over 50,000 U.S. service members and a further 50,000 civilians and family members are stationed here in Japan. And the United States will continue to deploy our most advanced military assets in the region. And with regard to this challenge, let me be clear: While all options are on the table, the United States will continue to work directly with Japan, our allies across the region, and China to bring economic and diplomatic pressure to bear on the regime in North Korea until they once and for all abandon their nuclear and ballistic missile programs. The President and I have great confidence, that together with Japan, and our allies in the region, we will protect the peace and security of this region, and achieve our shared goal of a nuclear-free Korean Peninsula. Security, of course, is the foundation of our prosperity, and prosperity is what I came to talk about with all of you today. Under President Donald Trump, the United States is deeply committed to strengthening our economic ties with Japan. For more than 70 years, our nations have been partners in commerce, bringing our peoples together and generating growth and prosperity for generations to the benefit of both our nations. Today, the United States’ partnership with Japan is one of our most vibrant and one of our most cherished. And the American Chamber of Commerce Japan has played a pivotal role in that relationship for decades. Since 1948, you’ve brought together hundreds of businesses, on both sides of the Pacific, to develop commerce between our nations and to invest in our shared future. And the same goes to all the businesses represented here today. I just had the opportunity to meet with a number of great American and Japanese business executives — companies like Aflac, IBM, Toyota, General Motors. All of you are pillars of our shared prosperity. And join me in a round of applause for these great business leaders who have joined us here today. We are truly honored by your presence. Your businesses create jobs and drive innovation in the United States and in Japan. And thanks in no small part to your hard work, the economic partnership between the United States and Japan will continue to grow and flourish. Of that I’m confident. Our two nations have powered the global economy for decades, and today, we account for nearly a third of the world’s gross domestic product. And the trade between us is an important factor to our success. In 2016, Japan was the United States’ fourth-largest goods exports market. From aircraft to medical devices, machinery to pharmaceuticals, the United States has sent more than $63 billion worth of goods to Japan last year alone. When you add in services, our annual exports are closing in on $110 billion, supporting more than 600,000 good-paying American jobs. Our countries have also invested historic sums in each other’s economies. America is a top foreign direct investor in Japan, with over $108 billion invested. And the benefits flow both ways. Today, Japanese-owned businesses employ 839,000 American workers, and Japanese foreign direct investment in the United States topped a stunning $411 billion — the second most of any nation in the world. And America is grateful. I know from firsthand experience how important Japan is to the American economy. And some of these business leaders I actually met in my old job. As governor of the state of Indiana, in 2013 and 2015, I led a group of business and community leaders here to Japan. I’ll always be incredibly appreciative of the more than $1.8 billion in planned investments and the nearly 7,000 jobs in the state of Indiana that have been created by Japanese-owned firms during my time in office. I must tell you that I saw firsthand in the state of Indiana more than 250 Japanese companies that came not just to do business, but to help build communities. And the relationship that I saw develop in communities large and small across my heartland state could only be described with that Japanese word kizuna. It’s a bond. It’s a bond of friendship, of shared heritage and shared values. And now, as Vice President, I’m grateful to all the Japanese businesses that are investing all over the United States at this very moment. I believe the best is yet to come. Ever since President Donald Trump’s election, Japanese businesses have dramatically increased their commitment to the American economy, and we’re grateful. Last December, for instance, SoftBank announced a $50 billion investment in the United States, creating 50,000 new American jobs. And in January, Toyota unveiled a $10 billion investment in America, and just last week dedicated more than $1.3 billion to a plant in the state of Kentucky. These are only a couple of examples of many more that I could name at the podium today. The truth is, though, is that our economic partnership with Japan could still be even stronger, and that’s why President Trump is taking critical steps to strengthen our bond in the years ahead. President Trump has made it clear that our administration will strengthen our international trade relationships using a bilateral approach, and yesterday, at the President’s direction, I met with Japanese Deputy Prime Minister Aso to kick off the U.S.-Japan Economic Dialogue. And we’ve gone straight to work. This dialogue presents the United States and Japan with the opportunity to deepen our bilateral economic ties, and to foster jobs, prosperity, and growth on both sides of the Pacific. In yesterday’s meeting with the Deputy Prime Minister, we broadly discussed how we view the dialogue’s structure and goals. That dialogue we decided will focus on three key policy pillars in the months ahead. The first is to seek a common strategy on trade and investment rules and issues. Under President Trump’s leadership, the United States seeks a stronger and more balanced bilateral trade relationship with Japan. Our goal is simple: We seek trade that is both free and fair and benefits both our nations equally. This requires breaking down barriers and leveling the playing field so that American companies and exporters enjoy high levels of market access. The second pillar involves economic and structural policies, with a specific focus on fiscal and monetary issues. The President believes that both the United States and Japan can enact pro-growth and fiscally sustainable monetary and budgetary policies, which are both key to our long-term economic success. And the final pillar is what we call sectoral cooperation. The President and I are confident that we can find new ways to expand our economic ties with Japan in different sectors and industries. In fact, as we discussed earlier today with business leaders, one of the areas we agreed upon is to examine ways that we can promote and advance women empowerment in business in the United States and in Japan. American and Japanese businesses have much to offer each other, and by working together, the President and I believe that we can ensure that our two nations’ economic leadership grows even stronger in the years ahead to the benefit of the entire world. President Trump and I are grateful that Prime Minister Abe and Deputy Prime Minister Aso share our goal of a mutually beneficial economic relationship. And as members of the business community, all of you will play an integral role in helping us identify where and how we can make the most impact in the days ahead. President Trump and I value your continued input on the issues that you face, and we know that you can help us move toward a system that maximizes jobs, growth, and a brighter future for Japan and the United States of America. The truth is simply that a stronger American economy means a stronger economy for Japan and for all our trading partners. The United States and Japan are drivers of global growth, and under President Donald Trump, I can promise you, the United States will drive growth like never before. President Trump and our entire administration are working around the clock to pass an agenda of lower taxes, less regulation, better infrastructure, and a renewed focus on American energy. I’m sure you’ll be glad to know that tax reform is one of our top priorities. I don’t have to tell you how complicated the American tax code is and how much harm it does to business investment in our country — at home and, frankly, abroad. Our corporate tax rate sadly is one of the highest in the developed world — it’s more than 10 percent higher than the tax rate here in Japan. President Trump’s tax plan is to slash the corporate rate and reform the tax code and make it simpler, flatter, and fairer. Rest assured, our tax reform plan will make the strongest economy in the world stronger still. And it will benefit every business represented here today. The same is true of the President’s energetic actions from the outset of our administration to reduce the regulatory burden in America. The President already ordered every agency in Washington, D.C. to find two regulations to get rid of before issuing any new red tape on the American economy and the American people. The President has also signed more than a dozen bills turning back the last administration’s excessive regulatory mandates, and we’re going to continue to work with Congress to slash through the red tape. Now, these are just a few of the President’s policies that I could discuss today. I appreciate the feedback I received from so many of you at our earlier conversation about what our administration can continue to do to create an environment on both sides of the Pacific where we can grow and thrive. Rest assured, President Trump’s agenda in America will renew our country’s reputation as the premier investment destination in the world, which will benefit both of our countries and all the enterprises gathered here. And our success will further strengthen our bond with the businesses and the people of Japan. Of that I’m certain. The truth is that both our nations seek the same thing. We want good-paying jobs for our people. We want more investment and higher growth. We want innovation and high-tech companies. And we want our people to be more prosperous tomorrow than they are today. These are shared goals, and they’re shared values. And I can tell you that under President Trump’s leadership, and working closely with Prime Minister Abe, they’re the shared expectations of both of our peoples. We’re looking forward to working with all of you and with the leadership here in Japan to achieve that aim. This is a historic time in the relationship between our nations. For more than 70 years, the United States and Japan have built on a foundation of freedom and friendship, and together we’ve become the pillars that support opportunity and prosperity around the world. Today, I say with confidence: With your continued help, through an enduring alliance and economic partnership, and under President Donald Trump, our nations will reach new heights, for the benefit of all of our people, and for the benefit of the world. Thank you so much for having me here today and thank you for the opportunities that the enterprises here represent in America and in Japan. And God bless you all.